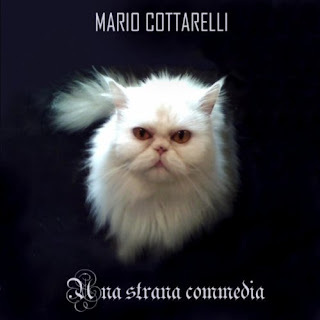 "Mario Cottarelli is one of my favorite RPI artists releasing albums in the current era. Born in Cremona in the 50s he was there for the classic era although he didn't get to release his work until decades later. A talented multi-instrumentalist and composer, "Una Strana Commedia" is his second album of original material. It's a wonderful album that builds on the instrumental strength of the first and heads in a more engaging direction, packing every minute with great melodies, interesting sounds, and superb play. The five tracks here range from 6-12 minutes in length and are immaculately constructed pieces of sophisticated, rewarding keyboard-heavy symphonic rock. Cottarelli is a first-class keyboardist and a great prog songwriter. In some ways he reminds me of Beppe Crovella in terms of his talents, and perhaps Crovella's Secret Cinema might be a reference point. But Cottarelli is a more interesting musician and the dense layers of tightly-wound, reasonably complex prog rock remind me even more of a slightly lighter Deluge Grander. Like Grander, the first plays of Commedia leave you somewhat sonically overwhelmed. There is so much going on, so many criss-crossing ideas and counterpoints that initial plays are exhausting. Like Grander, it took several plays to really warm to, and then suddenly the intricacy of Mario's construction comes alive and you really appreciate all the cool parts he has packed these tracks with. It's an album that demands active listening and when I sit and concentrate I'm just amazed. Big epic tracks, Cottarelli is such an enthusiastic composer, he's like a kid in a candy store who has so many flavors to sample. If you don't give the album your undivided attention you will miss things. Mario's keyboards are rich, vibrant, energetic; his textures are full of color and imagination. The songs are a light-hearted and upbeat symphonic which pulses along with the frequent addition of his warm vocals, dancing flutes, strings, choir vocal parts, and occasional guitar parts. Sometimes the programmed drumming sequences have a colder feel than I like, and I'll take a great drummer with a live sound any day of the week. But I get past that pretty quickly and "Una Strana Commedia" will be one of my favorite albums in a very fruitful 2011 for Italian prog. "Bianca scia" is probably my favorite track with the deep spacey organ section, the frantic piano, repeating flute motif and odd wordless vocalizations. But there's a musical romp here that will please just about every symphonic RPI fan taste. It's one of the few albums where I actually regret not being able to understand the lyrics. Usually I don't care about lyrics, I'm a music guy. But here, the album cover (also my favorite of the year) makes me really want to know the lyrical themes. It feels like a warm pondering at the absurdity of life with an appreciation for the preciousness of it. I can only guess. Listen often, this refined gem just gets better with each play. 4-plus stars, solid as hell. Mario, a million thanks to you for this wonderful work, I love it."